Hair regrowth In men and women – No matter where you turn, you’re bound to see someone who is losing their hair or suffering from it thinning. It is unfortunate that happens all the time. And, in case you haven’t noticed, more and more women seem to be subjected to this as well. It leaves people feeling insecure and self-conscious. That’s why hair regrowth in men and women is extremely important. Of course, in the past, people who were dealt this hand just had to grin and bear it. But a lot has changed and there are all kinds of solutions that can help. Certainly, there are also products available on the market that are just there to take your money. They really don’t have any scientific proof that they work and they just flat out don’t work. It should be noted that not only will you be wasting your money on such products, you’ll also be wasting precious time. Although this is cruel, it is a huge industry with a hungry crowd. That means that there are companies that can stand to gain millions of dollars by producing useless products and fooling the general population. Unfortunately, they cause a lot of damage. When thinning hair and balding occurs, it is important that you act as quickly as possible to help regrow hair. If it’s left dormant too long, it may be too late. So, instead of entrusting those companies, turn to products that have been approved by the FDA and shown to effectively regrow hair. In addition to the products that will work, such as the substance known as minoxidil, it’s important that you look toward altering your diet. Healthy hair relies on certain nutrients. Those nutrients include vitamin B6 and biotin, but there are many more. So, if you aren’t getting enough of these in your regular diet, then you should supplement it. 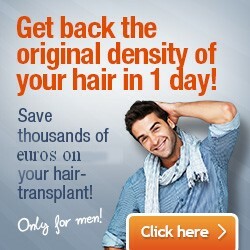 By doing so, you will improve the health of your hair, and have a growing back fuller and shinier than ever before. There are supplements that include a variety of vitamins and nutrients that are designed to stimulate the follicles and promote hair regrowth. Although you can supplement your own diet, there are specific concentrations of the various minerals and vitamins that would encourage your hair to regrow. So, if you are serious about correcting the problem, you should be doing all that is recommended and backed by clinical studies and the Federal Drug Administration.